Our specially designed high-end silent disco equipment includes top of the line wireless silent disco headphones and wireless FM transmitters. We currently offer two models of silent disco headphones and a wireless receiver for use with any wired headphone. The over-ear comfortably-padded silent disco headphones are adjustable in size and each headset features a personal volume control and channel switch allowing for optional toggling between different frequencies. Offering guests the ability to switch genres with a tap of a button is one of the most unique features of a silent disco event. The silent disco headphone sound quality is crisp with clear highs and deep lows — perfect stereo audio regardless of position in the venue (front row or restroom 🙂 ) creating an immersive and fluid atmosphere for guests to freely move around the venue without sacrificing auditory bliss. 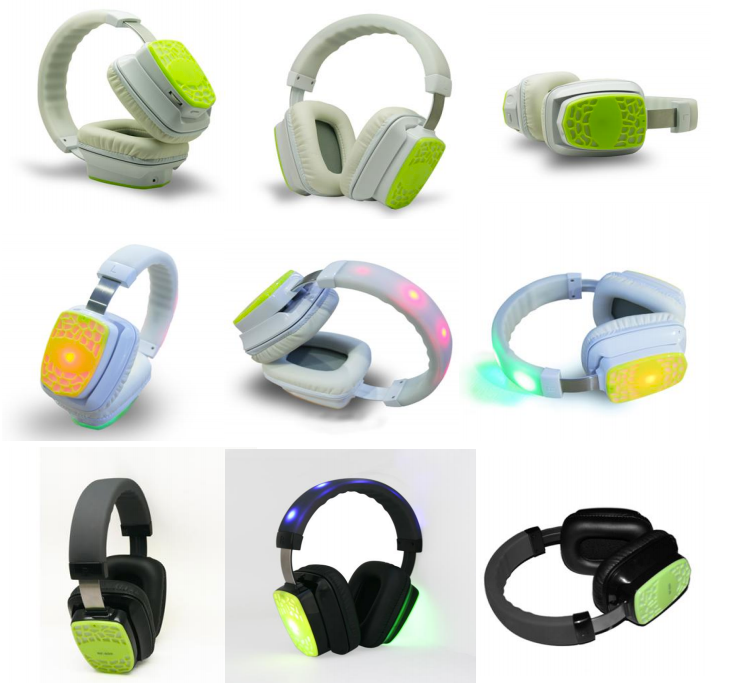 The Silent Storm Trooper Model (above) is available in a variety of colors and features multi-colored lights on the sides as well as bouncing LED lights on the headband with channel-specific colors (3 and 4 channel headphones available). 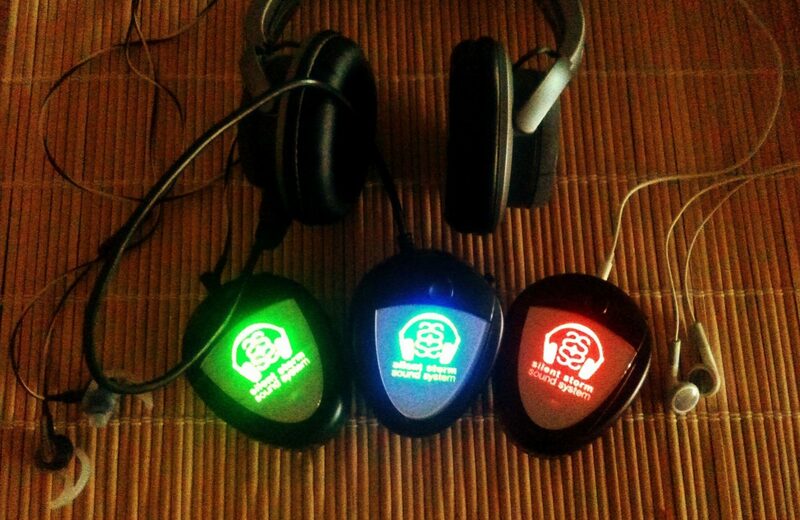 These silent disco headphones are perfect for parties and look fantastic at night. Since the headband lights vary in color depending on what channel one is listening to, guests can quickly see what channel friends are on — and DJs can see who’s listening to their channel. These silent disco headphones arrive fully charged and will last about 8-10 hours at maximum volume before needing to be recharged. Due to the powerful built-in battery, the Silent Storm Trooper headphones are our best sounding silent disco headphones and will pick up a clear signal even in the most troublesome areas with external interference (city rooftops, etc). The Basic Model (below) is our most popular and affordable 2-channel pair of silent disco headphones. This model is powered by two AAA batteries which can be quickly replaced (with included spare batteries) during an event. While the Basic Model has slightly less oomph than the Silent Storm Trooper headphones above, they still pack a punch and sound fantastic. The other main component of the silent disco equipment is the FM transmitter which has RCA input and is compatible with any audio source. The silent disco transmitter has a radius range of 300-500 meters, depending on your event’s location. This powerful signal frequency can allow for music transmission through walls and even across multiple levels. 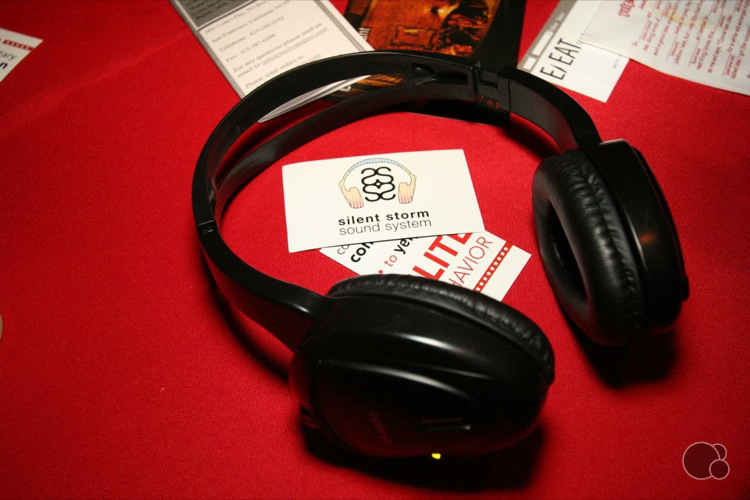 In 2012, Silent Storm introduced a brand new product to the market: The silent disco wireless receivers for wired headphones. These receivers have a belt clip on the back and can be secured to the guests’ clothing – or to a branded lanyard. The silent disco wireless receivers allow for guests to plug in virtually any brand of headphones directly into the belt clip receivers. It’s a perfect solution for headphone companies and brands who wish to use their own headphones in a silent disco-style branded activation. Interested in renting silent disco equipment or hiring our production services for your next event? Fill out the request for services form and we’ll get in touch with you as soon as we can.